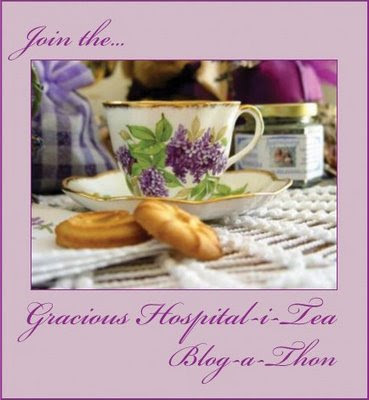 Gracious Hospitality: Decor-a-TEA ~ Blog Along with Us! Share ideas and pictures that incorporate tea and/or tea themes into home decor. Displays, art, prints, fabrics, and collection all count in this category. Do you use teapots and teacups as a part of your home decor? If so, describe how. My post for this week follows --- to read it, please scroll down. Enjoy a great week and happy posting! LaTeaDah ~ Thank you once again for initiating this wonderful tea blogathon. Week #3 promises to be rich with creativity. 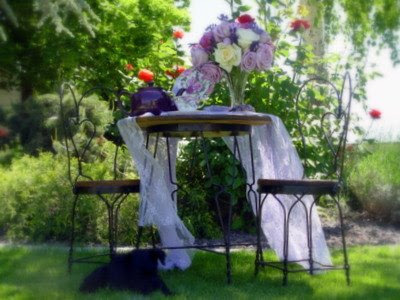 Your Decor-a-Tea collections and vignettes are just lovely! I love the blog-a-thon. Come over to my blog. There is a surprise waiting for you. This is such a great tea topic and I can't wait to see all the decorative ideas everyone comes up with! La Tea Dah - I've added my third week to the links list, but I have to confess that although I have visited everyone on the list thus far, I haven't left any comments except on yours. This is due solely to lack of time on my part this week. We are going away for a week's holiday and I'm trying to get things done before we go. I wanted to get my post done, but commenting on everyone else's might have to wait until we return. Suffice to say that as usual I've loved what everyone else has posted! I've posted! Check it out. Thank you for the comments! I'd like to know how you made your lavender 'picture' that we all put up on our sites. What a wonderful idea! I love all things tea. I'm so enjoying hopping the links. 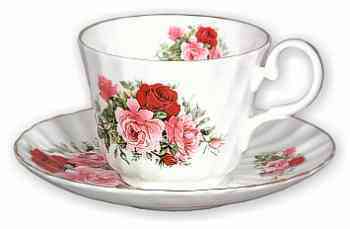 Hi LaDonna, I've added this week's tea post. 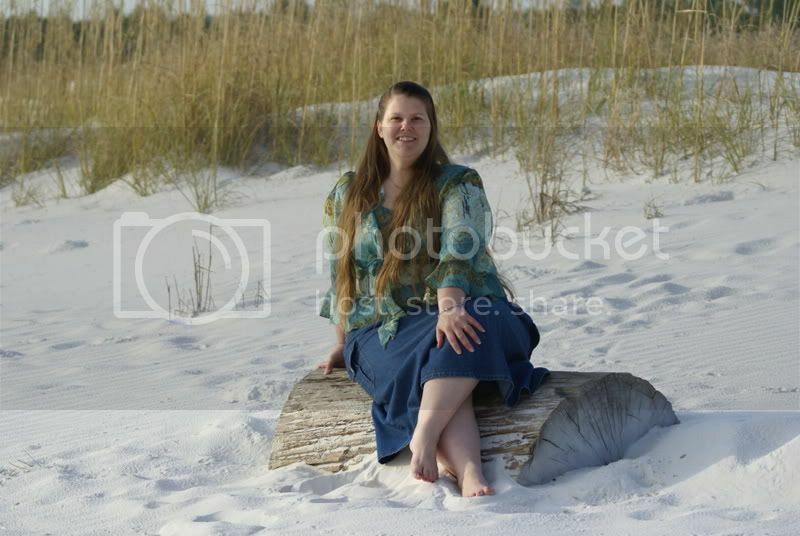 This is so much fun and I've really enjoyed visiting all the other blogs. I'd leave a picture if I could figure out how. i have my grandma's blue and white danish floral tea cups and demi tass cups hanging from a little shelf. My hutch has a tea pot collection on it very colorful. I just love all kinds of dishes to use for decorating. on second thought I posted a picture on my own blog for you Fresh Fixins. You can enter a comment there if you'd like a chance to win some Sweet Ginger Peach Tea and a copy of one of Mrs.Whaley's books. I have just finished my entry for week three. Again, this is such a great idea that you have had! It has been so much fun. Thanks so much for the invitation! You're a very gracious hostess. I hope I can learn from you. I'm going to join in again this week. La Tea Dah, I've enjoyed looking at your photos and ideals and will look forward to seeing everyone else's as well in the days ahead. Thanks for the opportunity to join along with all the others once more. What a great idea! I'll be back! This is so much fun. Everyone has such great displays. This is so much fun!!! Thank you for hosting this great blog-a-thon!!! I have met some new blog friends and seen so many wonderful tea ideas! My post for this week is up and I can't wait to visit all the others! This tea -a -thon is great fun. It will be interesting to see all these unique teapots! Thanks for hosting. Thanks for a fun topic! La Tea Dah, if you're not worn out from reading all of the blog-a-thon postings for this week, I added an extra one that you might enjoy since my find resulted from someone else's Week One posting. My, I did not realize how much tea decor I had in my home! I posted my link again ..maybe mr. linky will like me this time? ha. I added some more photos to my site in an additional decor-a-tea post. Hi, I think I am the subject of the smiley face! The smiley face shows up by your name when you link to a specific post. I link to my post for your bog-a-thon so you don't have to scroll down to find the post but are taken straight to the post. To do this after you have created your post and published it you click on the title of your post and that will change the link address at the top of your page. You then highlight that address, right click on it, click on copy. Then go to the host page, in this case Gracious Hospitality, go to the end of the post where Mr. Linky is, enter your blog name, then paste your address in the space provided. After you enter it a smiley face will appear next to your entry! I found your blog yesterday and fell in love. Strong words I know but, it's true! If it's OK with you I would like to join your Tea-A-Thon. I signed into the list but, I made a mistake while signing in and I was wondering if you could fix it for me. I'm on the list as #'s 58 & 59. Would you please delete 58 as it's the same as 59. Thank you and I look forward to bloging along on your Tea-A-Thon! I posted a week three post finally. I seem to be running a few days behind on each of these! This is my first chance to participate as I have been caring for my MIL with Alzheimers but she is back home with FIL now. I have been blessed and encouraged by all things tea and have finally been able to put up a post at my site. Thanks so much for the beautiful web ring of sites I still have yet to explore!